Mazda 2 1.5 SE-L Nav+ 5dr 2019 Review | What Car? What Car? will save you at least £417, but our approved dealers could save you even more. 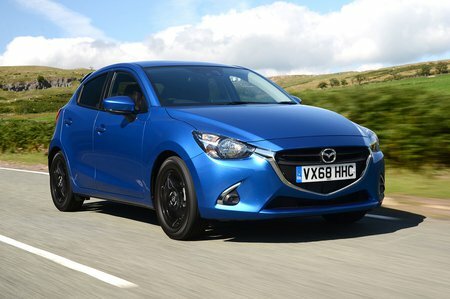 The Mazda 2 has a reasonably plush interior and very economical engines, when it comes to real-world fuel economy. All but the basic trim level offers a reasonable standard of equipment, too. Yet these days it has been overtaken by much newer models. Rivals that include the Seat Ibiza offer more space, better handling, a more comfortable ride, and greater refinement. SE L Nav+ is a considerable step up from the lower trims and is the trim we’d recommend. In addition to the lower levels, you get lane departure warning, smart city braking, rear parking sensors and that 7.0in touchscreen with DAB radio and sat-nav that’s worth upgrading for. Out of the three naturally aspirated 1.5-litre petrol engines, the mid-range 89bhp Skyactiv-G version is a popular choice. Lacking a turbocharger, you do need to rev the engine hard to make good progress on motorways. Around town this is less of an issue and it feels responsive enough.